Modifying tailpipes to increase a motorcycle’s noise is illegal, but the CHP shows very little interest in enforcing the law despite the magnitude of the problem. The American Motorcycle Association itself warns, “The AMA believes that few other factors contribute more to misunderstanding and prejudice against the motorcycling community than excessively loud motorcycles. 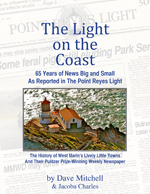 • A driver in Point Reyes Station was cited for tailgating, I was pleased to read in the local press a couple of months back. We need more such enforcement throughout West Marin. “Most rear end accidents are caused by tailgating,” warns Cal-Driver-Ed.com. “To avoid this, use the ‘three-second rule.’ When the vehicle ahead of you passes a certain point, such as a sign, count ‘one-thousand-one, one-thousand-two, one-thousand-three. This takes about three seconds. If you pass the same point before you finish counting, you are following too closely. “Sometimes you will need more than a ‘three-second’ cushion. Give yourself a ‘four-second-or-more cushion’ when… crowded by a tailgater. Allow extra room between your car and the car ahead. Then, if you need to slow down you can do so gradually. You will be able to avoid braking suddenly — and being hit from behind by the tailgater.” I would add that slowing down also makes sense at night when you’re more likely to encounter wildlife on the road. Tailgating is a recipe for road rage particularly in West Marin. Here drivers can go for several miles (particularly at night) before finding a safe place to pull off the road and let tailgaters pass. • If a film company plans to shoot on or adjacent to a county road in Marin County, it must first get a permit from the county Public Works Department. Among the provisions of the permit are that: 1) The film company must hire off-duty California Highway Patrol officers to direct traffic since the county doesn’t want nonprofessionals doing it. 2) If filming stops traffic, the road must be reopened every three minutes to let vehicles through. For the motoring public, these instructions are clear and explicit, but as an article by Beau Evans in the Feb. 26 Point Reyes Light reported, the Highway Patrol doesn’t feel bound by county regulations. On Feb. 11, officers from the Sonoma County district of the California Highway Patrol handcuffed a 78-year-old driver on the Tomales-Petaluma Road when she became upset that officers were allowing a film company, Bandito Brothers, to overstay its time blocking the road. The lack of proper enforcement caused her to miss a doctor’s appointment. When she tried to get some help from an officer, he instead tried to bully her, “aggressively” ordering her to get back in her car, she later wrote Marin County Adult Protective Services. She got back in her car but got out again 10 minutes later to ask how much longer the holdup would be, according to the summary in The Light. “Then [the officer] got very angry,” she noted. With the driver upset at being forced to miss a doctor’s appointment, officers decided she was “irrational” and placed her in handcuffs “for her own safety.” Or so the CHP reported. You’ve probably noticed that bullying members of the public has become a standard police practice all around the country these days. Officers use shows of anger to establish their authority when there’s no need to do so. It doesn’t earn them any respect, and it can create problems. The elderly driver received a cut hand and bruised wrists from the handcuffs. The CHP tried to dismiss her injuries as no more than reopening old wounds, claiming that handcuffs won’t cut anyone. But as the driver noted, our skin gets thinner as we age. I can vouch for that myself. So why would the Highway Patrol be so indifferent to the needs of the public and so solicitous of the needs of the film company shooting a Kia commercial? Even though officers are on hand to ensure traffic safety, state government is not paying for their overtime. The film company is, and this too often results in CHP officers acting as if their role is to control the public for the benefit of the film crew, not the other way around. The Marin Public Works Department has previously reminded the Marin County Area CHP that it is bound by the three-minute limit. However, the CHP officers in Tomales that day were from Sonoma County, and the spokesman there said his office wasn’t aware of Marin’s three-minute regulation. The Light also quoted a state CHP Film Media spokesman as saying that despite the regulation, officers have “discretion” to ignore time limits on county roads. The spokesman acknowledged, however, that there’s nothing in writing that gives them the discretion to help film companies at the expense of the motoring public. With officers acting as if they’re on the payroll of the film companies, could there possibly be a conflict of interest? Good suggestions, Bob. Thanks for writing. Sparsely Sage and Timely is powered by	WordPress 4.9.10 and delivered to you in 0.526 seconds using 50 queries.